What material would you like your door to be? Do you want windows in your door? What about side lights or a transom window above the door? Will the front door be exposed to the elements, or will it be protected? Do you want a custom door specifically crafted for your home? Or is purchasing a ready-made-door better for you? Front doors are made from a variety of materials including metal, fiberglass, wood, and wood composite. Here is some information about each type of material. 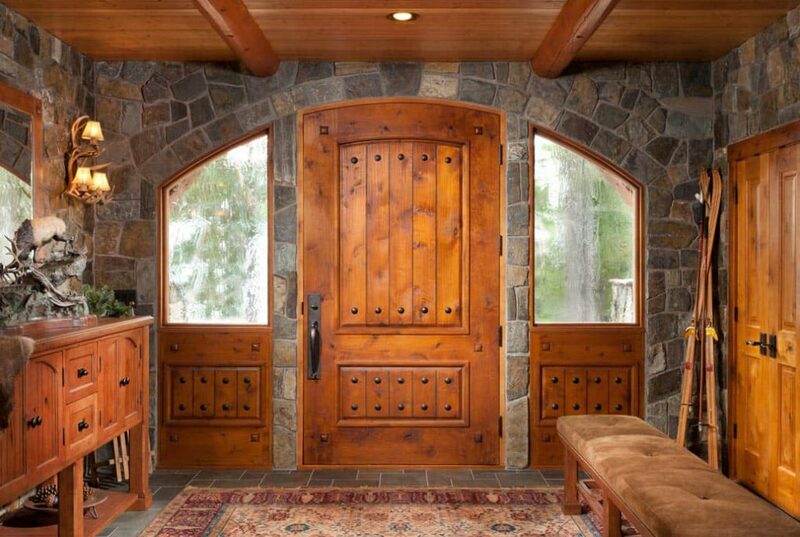 Wood doors are often the first choice among log and timber frame home buyers. The natural beauty complements the aesthetics of their new home, while the substantial weight adds a sense of security. Wood doors require staining or painting on a regular basis to preserve their natural appearance. Doors that face south or are not protected by a porch will require this maintenance more often. Any hardwood species can be used to craft a wood door. Kiln-dried wood, and frame and panel construction counteract the effects of climatic or seasonal changes. Like the logs and timbers of your new home, wood doors may warp or twist. In order to limit the natural warping and twisting of the wood, wood doors must be properly sealed against temperature changes and moisture. Wood doors are an excellent insulator against temperature changes despite lower R-values than other types of doors. Steel doors are durable and strong making them a popular choice for front doors. However, steel doors do not have to be plain and flat. Nowadays, manufactures can stamp the appearance and texture of wood grain into the metal. Steel doors offer greater R-value than wood doors because they are often filled with insulating foam or a wood-and-foam core. Want a door that combines the best of wood and steel doors in one? Try a fiberglass door. With its woodgrain texture, this type of door creates the warmth of wood when painted or stained. With their solid foam cores, fiberglass doors offer the same energy efficiency of steel doors. In addition, fiberglass is durable. It does not dent or rust like steel doors. It does not crack, split, splinter, or warp like wood. Unlike wood doors, fiberglass doors resist swelling and shrinking in moist or extreme temperature climates. Wood composite or molded skin doors look very much like natural wood, but they provide better insulation because of their foam cores. 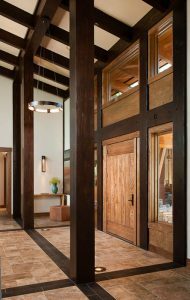 The doors share the same internal construction as the steel or fiberglass; however, they are covered with hardboard skins molded in the shape of traditional stile-and-rail doors. Check out the entry & foyer photo gallery for more front door inspiration. It’s important to keep in mind what material you choose for your door and if it’s suitable for the climate you live in. For example, you might not want to get a wood door if you live in a climate that experiences a ton of precipitation. I would never have thought to look at fiberglass or wood composite doors for my home. I like that the fiberglass offers the same energy efficiency as a steel door but can look like a beautiful wood door. I will have to decide on how I want my front door to look first and then check the best make for my needs. Thank you for the information! My wife and I are wanting to get a new front door for our house since the last one has started to look a bit worn. I like that you mention how steel doors can be stamped with the appearance and texture of wood grain. This would be a great way to get that classic wood look while still having a stronger metal door. Thanks for sharing!